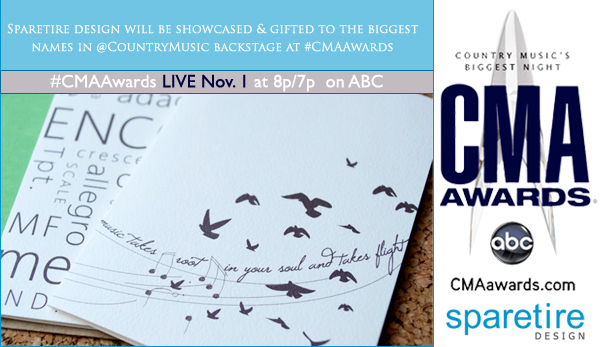 Sparetire Design, in association with The Artisan Group, will be participating back stage at the official gift lounge for The 46th Annual CMA Awards. Being a big fan of music, I am beyond excited to participate in the official gift bag and lounge for The 46th Annual CMA Awards. The event is held backstage, October 29 – November 1, 2012, at the Bridgestone Arena in Nashville, Tennessee. After the performers get ready for Country Music’s Biggest Night™ they will come through the official lounge and admire the hand made wares of The Artisan Group. The musicians will walk a way with a huge bag full of items designed for them and the CMA Awards. There are 30 artists’ work in the bag, including a set of Sparetire Design’s music inspired designer stationery. I will have stationery on display, backstage at the lounge as well, with music and Nashville at the heart of the design! Country music’s biggest stars will be walking through; I am beyond excited to have my work, that is very much inspired by music, in front of artists and musicians that inspire me. One of my favorite bands, The Civil Wars, (check them out!) is nominated for Vocal Duo at the CMA Award show. The prospect of Joy and John Paul having a set of my stationery is positively thrilling!